"Paleo (eating like our pre-agricultural revolution ancestors ate) chili is made without beans. In the west we typically include beans, but I think even non-paleo eaters will enjoy this deep smoky flavorful chili. This is best made a day ahead so the flavors can meld together. Serve with green onions and sour cream." Soak chipotle pepper in boiling water until softened, about 10 minutes. Remove pepper from water and mince. Melt coconut oil in a large pot over medium heat. Cook and stir onion, green bell pepper, and red bell pepper until tender, 5 to 10 minutes. Stir garlic and minced chipotle into onion mixture and cook until fragrant, about 1 minute. Stir bison and sausage into onion mixture. Cook and stir until meat is browned and crumbly, 10 to 12 minutes. 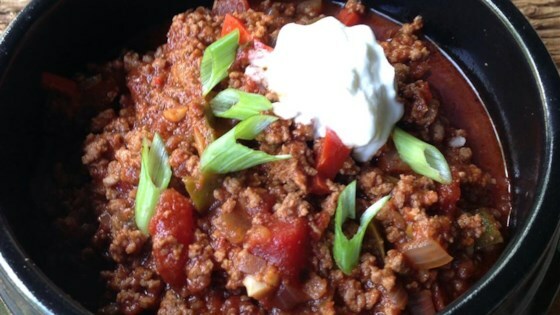 This chili can be enjoyed by non-Paleo eaters by adding 1 (15 oz.) can of drained and rinsed pinto beans. You can substitute beef for the bison and turkey sausage for the pork sausage. It had a very loose texture and it was definitely lacking with no beans or sour cream. Guess it's just not my cup of tea? Also- what are tomatoes doing in a paleo recipe? Made this exactly as written, except that I put it all in the crock pot overnight instead of sauteeing everything. Delicious! !